Pathways Week – Buckeye Gathering! The Buckeye Gathering grew over the years and a new offering naturally emerged; Pathways is a deeper dive into a smaller village experience, in which you choose one class to jump into for five full days. We have invited an incredible bunch of teachers to share their immense knowledge and expertise with us. Much different than the Buckeye Week, you actually find the class that will be your focus, and register specifically for that Pathway. See 2018 descriptions below. Beyond the classes, Pathways has only a third of folks on site, and entirely new possibilities for relating and creating our village. Be part of an emergent culture, cross-pollinate, share stories and song in a more intimate setting throughout the Pathways Week. In 2016, we gave this new formation it’s first go, and are delighted to offer it for a third time. For years, the Slickrock gathering has been doing something similar in May in Utah. Thanks for sharing the name ‘Pathways’ and the model! Join us for Buckeye Week, Pathways Week, or both! Using stones to grind things. We learned a lot in our first experimental years, and we are still playing out new possibilities. There will be emergent properties, so come prepared to go with the flow and have some easy-going fun as we learn what this new aspect of village calls for. There are many overlapping aspects with Buckeye Week and Pathways Week. For instance, we will feed you breakfast and dinner, you bring your own lunch. A major difference is there will be no more than 200 folks onsite, and less overall activity than the Buckeye week. We will have a small Youth Camp, as well as other delightful offerings and surprises along the way. Let’s just see how this works, shall we? This feels like a pivotal moment in our growth and our place in the community. You are invited to join us for a pretty dang unique opportunity! If you are unsure about jumping in, trust that there are good reasons we have chosen this through years of thoughtful design. Thanks to all the other gatherings, the pantheon of teachers, the dedicated years of students, the Ancestors who came before, and all the forces that help us gather together each spring. When registration is open you can enroll in either week, or both. If you join us for Pathways, you will need to enroll in your selected class at that time; so please peruse the following information to help you make your selection. Below you can see some details on what we have so far. Arrival is May 8, and five full days of classes begin the next day. Camp will close and disperse on May 14. Find a Ride/Ticketshare to the Gathering. Though only some of the Pathways are open to youth who are attending with parents, we like keeping all ages in our village setting. Youth Camp includes free time, nature based activities, and visits to the Pathways classes; think organic and awesome. If you are enrolled in a Pathway, you can purchase a ‘Youth Camp’ ticket for your young one. If your young one is under 5, they are your responsibility, and you will likely not be able to participate fully in your class. If you are bringing your kid, be prepared to pull away from your class as needed to take care of them. The details of this camp will depend largely on how many kids and of what ages are registered. Dense patches of tule rise like forests of green spikes from wetlands or areas of seasonal flooding. Once you recognize the genus, you will see them everywhere. Come and explore the world of Tule Ethnobotany. We’ll learn what makes tule, a large bulrush that is abundant in marshy areas of California and all over North America, such a versatile and practical plant for cultural uses. Tule was made into baskets, mats, dolls & toys, boats, slings, duck decoys, sandals, thatched houses, visors and clothing. Even the rhizomes, a continuously growing horizontal underground root, was eaten. -The botany of tule. How to identify the genus and where tule grows. -How and when to gather, dry and prepare tule for a particular purpose. -Making cultural items out of tule: mat, visor, sandal, basket, model boat and other utilitarian uses. -Incorporating tule into educational programs, teaching traditional skills, school curriculum and conservation. You learn by observing, deducing and applying, which leads to a deeper understanding and respect of tule and the environment. Come and join me on an adventure of learning and a relationship with our natural world. Start your journey with “shoshin”, a beginner’s mind. Knowledge is not complete until it is passed on. Come learn to weave closed twine or fine coil Pomo basketry techniques. This class will cover the entire process including harvesting, processing, curing, sorting and the final steps of preparing materials for weaving. I will be providing cured Redbud, sedge root, and willow for weaving a small basket of either type. Please bring a sharp knife, fine point scissors and a comfortable chair. I will have fine point basketry awls available for use, bring one if you have one, or buy one from me. Corine Pearce is a Pomo basket weaver with ancestry from Lake and Mendocino counties. Corine began weaving at the age of 9 and has over 30 years experience specializing in the many varied styles and techniques perfected by the Pomo people including twine, coil, cradle and gift baskets. In an effort to preserve this rich skill and heritage, Corine has decided to share the knowledge in hopes that others will come to love and appreciate the beautiful art, dedicated skill and the important environmental impact of Native basketry. Learning to become a bioregional herbalist is as simple as going for a walk. Again, and again. Deep connection through continued observation is the foundation for a bioregional herbalist. Learning about the plants found naturally occurring around us begins to deepen our relationship to place. Little by little, patterns begin to emerge which inform us as to how we can use plants for medicine. This intensive workshop is for those called to develop relationship with the plants around them for food and medicine. It’s also for those who have experience, but are seeking to go deeper to unlock the hidden “mysteries” embedded in the world around them. In this 5-day workshop we’ll explore the fundamental aspects of becoming a bioregional herbalist: developing relationship with place and the plants within it. This endeavor leads us to the study of field botany, respectful wild-crafting and participation with our environment, plant energetics, landscape observation, developing and exercising the senses (especially, the feeling sense) particularly in relation to place and plants, herbal medicine making, and applying these medicines for well-being and healing utilizing our knowledge of our homeland and plant energetics. We’ll be going for hikes, daily, so be prepared. Some days we’ll pack our lunch, but I’ll give advanced notice. I consider myself a bioregional herbalist helping people develop authentic relationships with wild plants. Beginning with a relationship to place, one can go deeply into the knowledge of one’s local plants for food and medicine, even with very limited access to third party educational resources (e.g. teachers, books, studies, etc.). Because I see our current system enrapt with the phenomena of the reductive scientific paradigm, I feel it’s essential we come to exercise and embrace the unspoken “feeling sense” which connects us to all living things and delivers knowledge directly from the ‘heart’ of the matter. Overview of weaving techniques of the entire world and discussion of different weaving regions all over the globe. Materials from all over the world will be available for people to try out and specific topics taught will depend on what individual students want to learn. Also included will be dyes and soft string basketry from all over the world. Part 2- “How tight can you make it?” – a class in watertight close weaves and stable, solid open weaves. Bring a project you would like to improve upon in any style. Materials provided for those without a set project. (Hemorrhoidal cream also provided…..). In this class students will learn the art of bow making with traditional hand tools and emerge with a self crafted weapon they can be proud of. We will also discuss different styles of bows, as well as bow design and performance. All necessary tools and materials will be furnished. production, use and study of pre-metal tools and technologies. 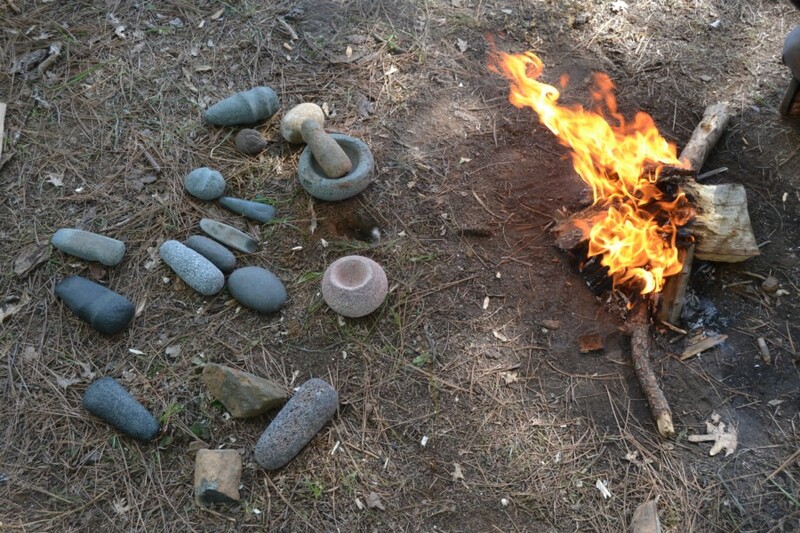 Starting with the earliest tools and using them to slowly work, think, discuss and sing our way to more complex tools. Bring your heart, mind, muscle and maybe a blister kit and some good leather gloves. Come immerse yourself into the arts & sciences, combined with a lot of physical education (also known as work). Immerse yourself in the world of plant & animal fibers. Learn all about native & naturalized plants, discuss the processing and characteristics of fibers in general, extract fibers from a variety of sources, and learn ways those fibers are used to make string, ropes, nets, belts and much more. It’s all about the energy of the twist! In this intensive week, we will explore the different aspects of what makes this essential craft work, how people figured it out by observing natural phenomenon and the many ways that this knowledge can be applied to create beautiful and durable products that have been pillars of our existence for tens of thousands of years. This week also includes: three ply string, knotless & knotted netting, net-making tools, cordage weaving techniques, cardweaving, ropemaking and much more. Tamara Wilder became fascinated by ancient living skills in 1989 when she first attended the Glass Buttes Knap In and Rabbitstick Skills Gatherings. She was “hooked” and immersed herself completely in practicing skills in the mountains outside Santa Cruz with only a bicycle and feet for transportation. In those first years she feels blessed to have met and become close with numerous friends and mentors. Ever since, she has been dedicating her life to enjoying, learning, researching, experimenting with, writing about and teaching Paleo Technologies through a variety of programs, workshops & demonstrations on a range of skill topics at a plethora of locations through her company Paleotechnics: Arts & Technologies of Earth Peoples. Her main offerings are currently her Ancient Living Skills Overview Programs. We will get in-depth with all the steps in the process of pottery making, from finding and processing clay from the land, to shaping, painting with plant and earth pigments and different ways to fire. Kelly Magleby is a primitive potter and who is inspired by the ceramic art of the southwest, particularly of the ancient Anasazi culture. She has been traveling and teaching pottery for seven years with a focus on how various landscapes shape culture, art and design. Kelly is interested in promoting clay as a path to re-connect to the earth using all the elements. Kelly currently lives in Orem, Utah with her two daughters, and an assortment of animal friends. John Olsen is a prehistoric pottery enthusiast. He worked as an archeologist for many years. His interest in pottery began in high school and continued into college, where he majored in ceramics. He taught himself traditional pottery through experimenting. John is also an archaeologist, large machine operator, and goldworker, specializing in prehistoric metallurgy. He has not only mastered the art of pottery replication, but also flint-knapping, anasazi masonry and many other traditional and ancient skills. He joins us at Buckeye as one of the masters of his craft. And, of the ancestral arts. In this full brain tanning course, you will go through the entire process of transforming a salted hide into the beautifully soft material of smoked buckskin that has been used for thousands upon thousands of years to clothe our bodies and provide us with a durable and flexible leather used is everyday lives. This seemingly magical process is also a complicated series of chemical and physical processes which take time, dedication and a certain amount of physical work to unlock and fully understand. Beginners are encouraged to tan one hide. One day will be devoted to sewing, stitches, seams and designs for using your buckskin for clothing and other projects. Includes questions and discussion about bark tanning hides and how the process differs from and compliments braintanned buckskin. I am excited to welcome you to a weeklong intensive of animal tracking, behavior, ecology, and animal medicine. Unlike a one day class, this in-depth multi-day exploration of track and sign will build your pattern literacy and offer skills on how to read a landscape. As we explore the stories left on the landscape by the animals, you will learn the tools that will allow you to answer your tracking questions on your own, regardless of where you call home. After more than 20 years of the deeply practicing the art of tracking, I have come to understand that tracking my internal landscape is as important as reading my external landscape. More often than not the patterns we see ecologically mirror our internal landscapes, whether it is in the intimacy of our family unit or in a larger cultural context. While we immerse ourselves in practical dirt time, we will also look at tracking as a metaphor for emotional, political and social patterns. By the end of our time together we will each walk away with not only a better understanding of Lake Concow and its many animal species, but also with the knowledge to establish this same Sense of Place both externally and internally, where ever you may call home. As a wildlife ecologist, author, and an educator of both young people and adults I am often asked, “what is the most important way to ‘show up’ during this interesting and inspiring environmentally, socially, and politically wrought time?” I too have asked myself this question and pondered it deeply. And the bit of action I keep returning too is this… To know one bit of land deeply and well over a long period of time. For when we can create empathy for something as Other as a lizard, a Muslim or Republican becomes far less scary and much more approachable. I believe our work right now is to create relationships, to embrace the Other, and bridge the differences. as well as the instructors theories of knife usage, design and maintenance. In this Green Woodworking intensive Kiko Denzer will teach you to make all kinds of practical household items from green wood: chopsticks, butter spreaders, cutting boards, limb hooks, eating spoons, ladles, spatulas and other cooking utensils as well as shrink boxes (canisters made from hollowed whole branches), small cups, and bowls. We’ll also cover basic decorative techniques, including chip carving, kolrosing, 3-d sculpture, paints, and oil finishes. Class will include discussion, demonstrations, and practice. We’ll cover tools, knife and axe technique, use of the froe for splitting and dividing timber into useable lumber, shave horse and draw knife, the dynamics of wood, grain and shrinkage, sharpening theory and practice, and design. As I will only be able to bring one lathe, I will demonstrate basic bowl-turning technique, and then we’ll arrange for interested students to take turns trying it out. Kiko using one of his foot pumped lathes. Materials to bring: Mora Blade 106 or something close, preferably w/a Scandinavian grind and any other hand tools you’d like to bring — especially a carving hatchet. Age Limit: 13+ years; younger children need to confer with Kiko before registering. Email Kiko at potlatch@cmug.com to ask about your younger child’s participation. This class will be a deep dive into the world of brain tanned buckskin. Our aim will be to learn about not just the material, but the deer themselves and how we live into our own skin and clothing. We will work to understand the variability between different hides and within one hide, what this has to tell us about the lives of the deer, and how to work within this variability to make the best clothing from it. We will discuss pattern making and layout, different seams and stitches, shaping and design. Students will begin with a small project to learn basic techniques and stitches and then have the opportunity to start a larger garment of their choice with support in pattern making, stitch selection and more. Buckskin is not provided so students must bring or purchase their own hides for the class. Materials Fee: $40: handmade awl, buckskin scissors, come with class. Other tools available for use. Buckskin hides not included. Brain tanned buckskin has been a passion for me since 1995, when I attended my first primitive skills gathering, Rabbitstick Rendezvous in Rexburg, Idaho. My week there changed the course of my life. Always fascinated by the natural world and a student of biology and botany, the skills taught at the gathering resonated with me deeply. Here was an opportunity not just to study the natural world, but to interact with it in a meaningful way. To have it literally form the substance of my life. Tanning and working with buckskin were perhaps the most compelling of all of the skills I saw presented. I vowed to one day make myself a full set of buckskin clothing.